Two Roads by L.M. Augustine - On Sale NOW! Two Roads by L.M Augustine is on sale today for $0.99 from Amazon! L.M Augustine is a fab author. I really enjoyed his previous YA release Click to Subscribe, so I was really excited to see he had released a new adult romance. 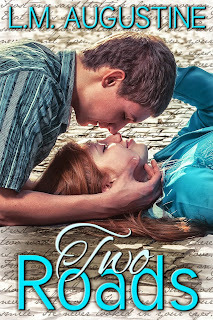 Two Roads is a hate-to-love romance with all the fun quirkiness that I've come to expect from this author. Cali and Logan spend much of the novel fighting, which you just know means they are meant to be. One of the best things about this story is that Logan is a total nerd... but he's hot too. He's basically my dream man. Ahem. ANYWAY! Point is, you should go buy it while it is on sale! Two Roads was published in 2013 and is available from Amazon and Smashwords.